“Kamen is currently at work on a water treatment system that was successfully tested just a couple months ago in a village in Honduras, he said. The portable device turns contaminated water into clean water by distilling it, using a fraction of the energy required by traditional distillation systems. Kamen predicts such systems could help solve health problems caused by waterborne pathogens all over the world. Credit goes to MedGadget for this news. Even though this is from last month and is “old” I thought it was important enough to highlight an organization that is focused on incubating the manufacture of low cost technologies. The main blog for AIDG (Appropriate Infrastructure Development Group) is well worth checking out for their mission and projects and Fast Company highlighted the organization as well as the Private Sector blog from the World Bank. AIDG also has highligted the involvement of yet another celebrity in the global health arena. As we posted previously Jay Z had an MTV special called Water for Life. Check out AIDG and the video links they have. When I first saw this news I was really excited as I thought it would be an opportunity to spread the word about this issue, however after trying to watch the 30 minute special on TVs in three different households at three different times I was unable to access the show. MTV was showing this special on one of their other channels and not the main channel AND the TV times were extremely poor (one of the three *total* showings I could find was at 7am). So much for spreading the word. I suppose I was naive in thinking millions would be watching MTV when this came on. Dr. Buttery at VCU has post on a new test for detecting arsenic, you can read that blog for more details. The folks at Brown’s Global Health Blog have also posted a story about water – Clean Water is Right (Economist Story). The Center for Global Development health policy blog discusses the coverage this topic is recieving in some high level journals such as Nature and BMJ. While this is not directly focused on solutions it is worth pointing out the coverage on human rights. Picking up on the APHA theme, the new Health Affairs blog (for a leading policy journal) had four posts last week on human rights that you might want to check out. In the lead up to World AIDS Day, the Kaiser Family Foundation is partnering with several organizations including MTV and Univision. Although this project from Univision focuses on the United States, it realizes the power of television as an ICT for health education, in this case for HIV/AIDS. Univision is the fifth largest television network in the United States and broadcasts exclusively in Spanish, largely targeting the Mexican and Mexican-American communities. This project may prove to be an interesting learning experience for international health and development, as Univision reaches nearly the entire spectrum of Latinos, from the very affluent to the working class, including new immigrants. MIAMI, FL, NOVEMBER 27, 2006 — (NYSE: UVN) — Univision, in partnership with the Kaiser Family Foundation, will air a half-hour special “Entérate… SIDA, 25 Años Después” (Get the Facts!…AIDS, 25 Years Later). As part of Univision’s Peabody award winning health initiative “Salud es Vida…! Entérate!” (Lead a Healthy Life…Get the Facts! ), the special will explore AIDS among Hispanics in the United States. This poignant special will feature an exclusive interview with Univision’s Emmy award winning talk-show host Cristina Saralegui, one of the first national Spanish-language on-air personalities to address this critical health issue…In addition to this half-hour special, Univision and Kaiser have developed a new series of Public Service Announcements (PSA) and informational vignettes that will broadcast throughout the month of December. These announcements encourage young Hispanics to learn more about HIV/AIDS, talk to their families and partners about HIV, and get regular HIV tests. The rest of this story can be found on the Kaiser Family Foundation website. RH Reality Check has also blogged about World AIDS Day, I encourage you to check out their website. A new book by Hans Rosling and others is out on Global health. You can read more on Dr. Rosling’s blog. Last week the Washington Post had an interesting article about the power of mobile phones. Ndiyo and NextBillion have also blogged about this. CHARKHAI, Bangladesh — The village doctor’s diagnosis was dire: Marium needed immediate surgery to replace two heart valves. The 28-year-old mother of three said she was confused and terrified. She could barely imagine open-heart surgery. She had no idea how her family of farm laborers could pay for an operation that would cost $4,000. Mahbubul Ambia, who started an Internet center in the town of Charkhai, has helped customers find doctors, make Internet phone calls and communicate by video conference. Mahbubul Ambia, who started an Internet center in the town of Charkhai, has helped customers find doctors, make Internet phone calls and communicate by video conference. The next day, Sept. 16, her father went to see Mahbubul Ambia, who had recently installed the only Internet connection for 20 miles in far northeastern Bangladesh. Ambia sat down at a computer, connected to the Internet by a cable plugged into his cellphone, and searched for cardiac specialists in Dhaka, the capital, 140 miles away. He found one and made an appointment for Marium, who like many people here goes by just one name. The specialist examined her and said she needed only a routine surgical procedure that cost $500. Villages in one of the world’s poorest countries, long isolated by distance and deprivation, are getting their first Internet access, all connected over cellphones. And in the process, millions of people who have no land-line telephones, and often lack electricity and running water, in recent months have gained access to services considered basic in richer countries: weather reports, e-mail, even a doctor’s second opinion. Cellphones have become a new bridge across the digital divide between the world’s rich and poor, as innovators use the explosive growth of cellphone networks to connect people to the Internet. Bangladesh now has about 16 million cellphone subscribers — and 2 million new users each month — compared with just 1 million land-line phones to serve a population of nearly 150 million people. From VOA: “A new report finds the health of people in Africa is worse than in any other part of the world. But, the report by the World Health Organization also presents a number of success stories that show Africa can tackle its own health problems. This report, for the first time, focuses on the health of the 738 million people living in 46 countries in the African region.” Read the rest of the story at VOA and you can view the full WHO report on their website. While in LA this past weekend I went to opening day of a brand new exhibit at the Los Angeles Museum of Contemporary Art (LA MOCA) entitled skin + bones: parallel practices in fashion and design. I was very surprised to see one piece in the exhibit displaying an innovation in emergency shelters for refugees by Shigeru Ban. From what I can tell Shigeru Ban is a world renowned architect who on the side has decided to devote some of his work to helping humanity. The gallery educator told me this piece was a part of the shelter and structure and innovation in structure theme. The entire exhibit took over six years to put together. 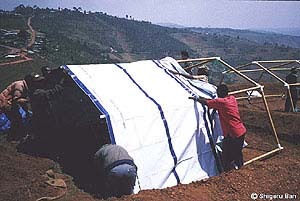 I watched the video of constructing paper tube shelters in Rwanda and noticed 3 basic supplies were needed: the paper rolls (the bones of the structure), plastic connectors (to connect the paper rolls), and string (for added stability). As Ban demonstrated the construction through this 15 minute video I was left with more questions than answers. I wondered, how much the paper rolls and other materials cost, how difficult it was to have these shipped, and how complex was it really to set up? I certainly applaud such a heralded architect and effort but I am also curious about on the ground reality.